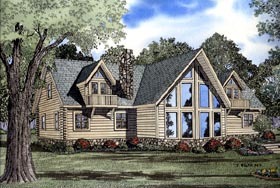 This plan has a side opening to the large Great room with fireplace. The Family room is located in the rear of the home and has access to the deck. The Master Suite includes walk-in closet. Master bath amenities include a corner shower and corner whirlpool tub. The Dining area opens to the Kitchen, which has a Eat at bar and access to the rear deck. The upper Floor has Loft area, two additional bedrooms, with unique ceilings and expansive closets. The Bathroom on the upper level has a corner shower and corner whirlpool tub.